Ever heard of Amanita caesarea? Did you know there are a few species of Amanita that people do actually eat? While definitely not recommended for beginners, there are some folks out there who enjoy chowing down on Caesar's mushroom! This mushroom, along with its North American cousins Amanita jacksonii and Amanita arkansana (and others), are part of a small group of edible Amanitas spread throughout different continents. Now you may be asking, "isn't eating an Amanita dangerous? Aren't there deadly species as well that will kill you?" Why...yes! Yes there are! For this reason, eating them is highly discouraged for beginners to mushroom identification and hunting. Honestly, they should be considered an off-limits edible for all but the most experienced of shroomers. 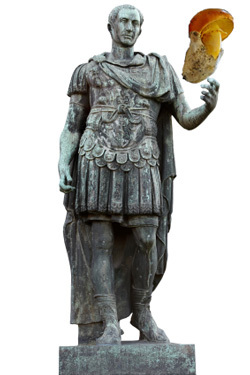 Yet that doesn't mean you shouldn't learn about Caesar's mushroom! This colorful beauty is full of history and shrouded in taxonomical mystery. First we'll take a look at how to identify Amanita caesarea, and then learn how to tell them apart from Amanita muscaria. Next we'll examine closely related North American species, and end with information on eating and a simple recipe. It's worth noting that, unlike some other Amanita species, this one does not usually have any warts or patches on the cap. This mushroom displays light yellow "free gills", which means the gills on the underside of the cap are not attached to the stem. Whether gills are free or attached is often an important factor in mushroom identification so look closely! The long cylindrical stem (or stipe) is usually around 3-6 inches tall (8-15 cm) and 1-1.5 inches wide (around 2-4 cm). Solid and a pale yellow to orange color on the outside with pale yellow to white flesh on the inside. The stem often displays a ring (or annulus), which is a skirt of flesh under the cap that's attached to the stem. This ring is the remnant of the partial veil; a layer of tissue that covers the gills to protect them while the mushroom is developing. At the base of the stem you'll often find a cup-like structure called a volva. This is the remnant of the universal veil; another layer of tissue that encloses the entire mushroom in a little "egg" when young. The volva is often beneath the dirt, so dig carefully around the mushroom to make sure it is or is not there! Great example of the universal veil and volva on an Amanita caesarea below. (Photo by Giuliagi (own work) [CC-BY-SA-3.0] via Wikimedia Commons). Ranges from North Africa to southern Europe, mainly in Italy. This mushroom does not exist (as far as we know right now), in the United States but there are similar US species (more on that below). 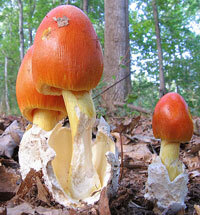 Amanita caesarea is mycorrhizal, meaning it forms a symbiotic beneficial relationship with the roots of certain trees. You'll find them fruiting under pine and oak. This mushroom grows directly on the ground, not on trees or dead wood. It can be easy to confuse Caesar's mushroom with another Amanita species, particularly Amanita muscaria (the fly agaric mushroom). While some people do take the fly agaric mushroom recreationally, it is considered poisonous and should be avoided in the wild. Unfortunately many identification characteristics can change over a mushroom's short life. Warts on a cap may falls off, a veil remnant could disintegrate, or you may not find evidence of a volva that was once there. For these reasons, please take the below chart with a grain of salt. This should just give you a general idea of the differences. Identifying Amanitas for the purpose of eating them should only be done by experts, and who wants to take that risk? Pic on the left by Archenzo, GNU free documentation license, via Wikimedia. Cap is smooth with no warts, although lightly striated at the edges (visible in the above picture). Cap is more of a deep red (although this color may fade with age). Cap often has white "warts" on the top, a remnant of the universal veil. Again, these may fall off with age. Of course there are Amanita species far deadlier than Amanita muscaria, so I can't stress enough that you need more than just the Internet to identify Amanita caesarea! Always have a hands-on expert teach you mushroom identification if you plan on eating anything. And make sure you back it up with a good book like the one on the right. Amanita caesarea doesn't grow in North America (as far as we know), so if you're in the United States like me you're not going to find it. Commonly found from Quebec to Mexico. 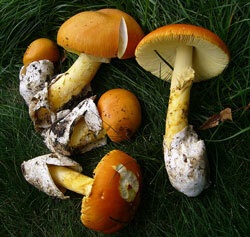 This species has very similar identification features with a volva, a striated orange cap, and yellow gills (right). If you're in the United States and think you've found Amanita caesarea, what you've probably found is Amanita jacksonii. People do eat them, but again it is not encouraged if you're inexperienced. Another similar species found in southeastern America. 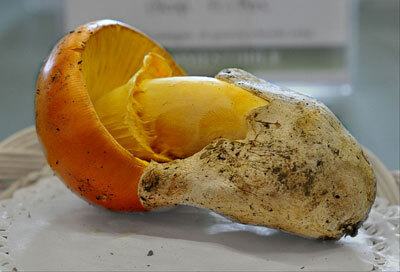 This mushroom is overall lighter in color, with gills that fade to white and a cap that's more yellow-orange than red. So what's the relationship between the American and European versions? How many species of "Slender Caesar's" exist in the United States? 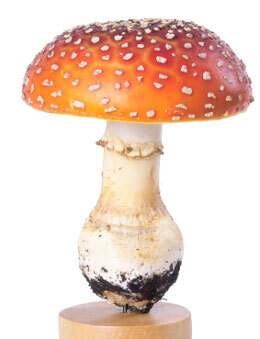 What defines a true Amanita caesarea from one of the many similar looking species across the world? The truth is nobody knows! As with so many mushroom species, their minute differences make it extremely difficult to say what truly distinguishes them. Only in-depth DNA analysis can clear up the confusion, so taxonomy and naming is always in flux. There are still so many unknowns about Amanitas. I'm sure we'll see some species re-classification in the future as our knowledge advances. Hey guys, it's got free gills! So far I've been pretty negative about eating Amanita caesarea, mainly to discourage beginners from being too cavalier about finding and consuming this mushroom. Yet people do eat them all the time and they are considered a choice edible! 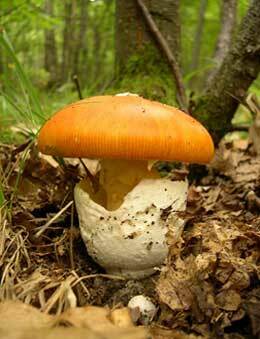 Amanita caesarea is a delicacy in Italy, where they're called ovoli mushrooms (ovolo means egg). The American versions are popular as well here in the US. So if you're an experienced mushroom hunter, or know someone who is, Caesar's mushroom can be a delicious find. They have a delicate flavor, so they're most often used in salads or prepared alone to showcase their light taste. The point is not to overpower the mushroom flavor with other ingredients. You can lightly sauté them with a little oil and garlic; although some insist cooking them in general is sacrilege. I almost always encourage cooking mushrooms before eating them, as it makes them more digestible and often removes any natural toxins. Not many wild mushrooms are edible raw, but this one is considered a rare delicacy so let's live a little. Keep in mind that you shouldn't necessarily substitute other wild mushrooms in this recipe! Wipe mushrooms down gently with a damp cloth. Make sure all dirt is removed. Slice in half lengthwise thinly. Add a little salt. Don't go overboard, just lightly salt each piece. Wait a few minutes for the salt to absorb. Season with lemon juice, olive oil, and a pinch of pepper. I didn't list amounts for the seasonings, as you really don't need a lot. Remember that you want to preserve the flavor of the mushrooms! Measurements should be in units of "drops", "pinches", and "dashes". I hope you've enjoyed learning about the different varieties of the beautiful Caesar's mushroom. Please stay safe and stay hungry!